Pirates, merchants, and even the occasional captain of a Navy ship all seek glory and fortune on the Caribbean seas! 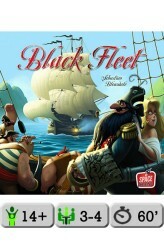 In the easy-to-play, tactical card-driven board game Black Fleet, you're in command of three different types of ships: your merchant ship earns you doubloons by conveying goods from one port to another, your pirate ship by attacking and stealing goods from merchants and burying them on islands, and the Navy ships by sinking your opponents' pirate ships. With your (not-always-honestly-won) money, you'll improve your ships by buying advancement cards, giving you powerful additional abilities. Outwit your opponents with fortune cards and combos, earn money faster than they do, and pay the ransom for the governor's daughter to win the game! 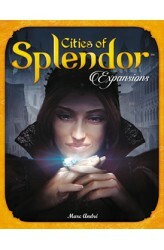 https://www.youtube.com..
Cities of Splendor is a quartet of expansions for use with the Splendor base game. Each expansion is added to the basic game and they should be played separately. The Cities replaces the noble tiles with 3 different city tiles (randomly taken from a pool of 14). The city tiles are objectives (in prestige points and/or development cards) and you need to fulfill one of them in order to win. The Trading Posts are special bonuses you earn by acquiring an array of development cards: more prestige points from the 1st noble tile you receive, an extra token when you choose the "Take 2 gem tokens of the same color" action, and so on. The Orient adds three decks of cards (one for each level of development cards). They are added on the right side of the regular cards and.. 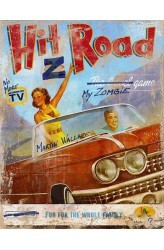 In the fast-paced and morbidly kitschy game Hit Z Road, you and your fellow players embark on a road trip going south from Chicago along America's famous Route 66 — now infested by zombies. As you travel though a deck of adventure cards rife with dangers, you battle zombie hordes, drive abandoned school buses, scavenge for gas and bullets, and explore a darkened, tainted American countryside full of shambling undead, haunted carnivals, and plumes of toxic gas. Your goal is to stay alive until you reach the safe, sandy beaches of the California coast. Three different stages of adventure cards create an experience of increasing difficulty and ensure that each playthrough is unique. 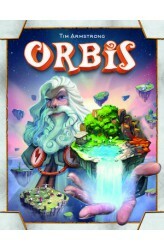 Each round begins with an auction that determines both player order and which cards you will encoun..
Orbis is a tactical game of world development and strategic resource management, in which players take on the roles of gods creating their best universes. Utilizing lands lost in the aether, players accumulate worshippers to spend on even more fruitful lands — some of which grant game-changing bonuses. The key to victory lies in having the most creation points (CPs) at the end of the game! On your turn, you must take a tile from either the nine region tiles in the center of the table or the available God tiles. (A player may take only one God tile throughout the game.) Every time you take a region tile, worshippers of the same color as the tile taken are placed on adjacent tiles, making the tiles left behind more enticing for the next player. Restrictions apply to region tile p.. Welcome to the Carlton House. Enjoy the luxury and solve the murders! How about a stroll in beautiful Queen's Park? Beware dogs and the occasional crime scene… Return to the streets of Victorian London, but also venture into brand new locations in the latest installment in the Sherlock Holmes Consulting Detective line: Carlton House & Queen's Park! 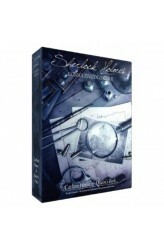 Like the previously released The Thames Murders and Other Cases, Carlton House & Queen's Park introduces ten exciting cases, each one drawing players deep into the world of Sherlock Holmes. Among these cases includes two classic, long out-of-print expansions which are now revised and updated. 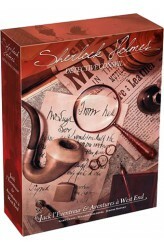 Whether you're playing solo or with up to eight possible players, you need your wits about you to solve the cases and beat Holmes..
Sherlock Holmes Consulting Detective: Jack the Ripper & West End Adventures is a standalone expansion to Sherlock Holmes Consulting Detective with updated graphics that features ten more cases to be solved in Sherlock Holmes' Victorian-era London, England. A "London Directory", map, and newspaper archives are included with the cases. 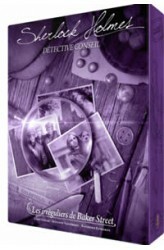 Included are six independent "West End Adventures" cases (redesigned and updated from the 1995 expansion), and a series of four new cases based on the Jack the Ripper murders. 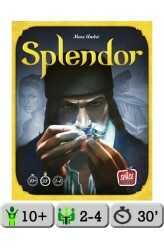 Jack the Ripper Cases: Mary Ann Nichols Annie Chapman Elizabeth Stride, Catherine Eddowes Mary Jane Kelly West End Adventures: The Strange Case of Dr. Goldfire The Murder of Sherlock Holmes A Cas..
Splendor is a fast-paced and addictive game of chip-collecting and card development. Players are merchants of the Renaissance trying to buy gem mines, means of transportation, shops — all in order to acquire the most prestige points. If you're wealthy enough, you might even receive a visit from a noble at some point, which of course will further increase your prestige. On your turn, you may (1) collect chips (gems), or (2) buy and build a card, or (3) reserve one card. If you collect chips, you take either three different kinds of chips or two chips of the same kind. If you buy a card, you pay its price in chips and add it to your playing area. To reserve a card — in order to make sure you get it, or, why not, your opponents don't get it — you place it in front of you face down for .. The T.I.M.E Agency protects humanity by preventing temporal faults and paradoxes from threatening the fabric of our universe. As temporal agents, you and your team will be sent into the bodies of beings from different worlds or realities to successfully complete the missions given to you. Failure is impossible, as you will be able to go back in time as many times as required. 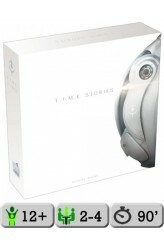 T.I.M.E Stories is a narrative game, a game of "decksploration". Each player is free to give their character as deep a "role" as they want, in order to live through a story, as much in the game as around the table. But it's also a board game with rules which allow for reflection and optimization. At the beginning of the game, the players are at their home base and receive their mission..
7553 AT (Alternative Timeline): Forget all you know about the Middle Ages, and explore a new reality in which magic changes everything. 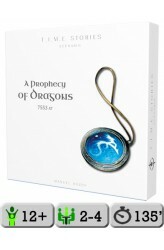 T.I.M.E Stories: A Prophecy of Dragons is the third T.I.M.E Stories scenario. 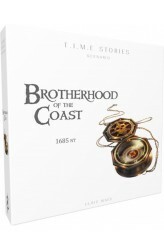 ..
Hoist the T.I.M.E Agency flag and ready yourselves to cross the high seas with Brotherhood of the Coast, the seventh T.I.M.E Stories expansion. Four seasoned T.I.M.E agents have been sent on a mission in the Caribbean in the 17th century, but contact has been cut off and their location remains a mystery. The receptacles in question are four well-known buccaneer brothers, and your help is needed to track them down. Rally your motley crew and ready yourselves for anything is possible in the waters that await you. .. In Hollywood, the ghosts of the past never sleep! 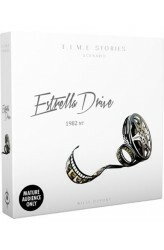 Embark on your next adventure into the past with Estrella Drive, the sixth expansion for T.I.M.E Stories. Like all T.I.M.E Stories adventures, you and your fellow players are members of the T.I.M.E Agency, sent to investigate a disruption to the Time Stream. This time, you and your fellow agents are sent to 1982 to investigate a temporal anomaly in a supposedly haunted Hollywood mansion. Please note that Estrella Drive is recommended for mature audiences as certain themes within this adventure may be objectionable to younger players. ..